While median home prices are clearly beginning to find some traction, having risen 6.6% from the first quarter of 2013 to the first quarter of 2014 (and just 12% of the national 2006 peak), national wages and income have remained stagnant. 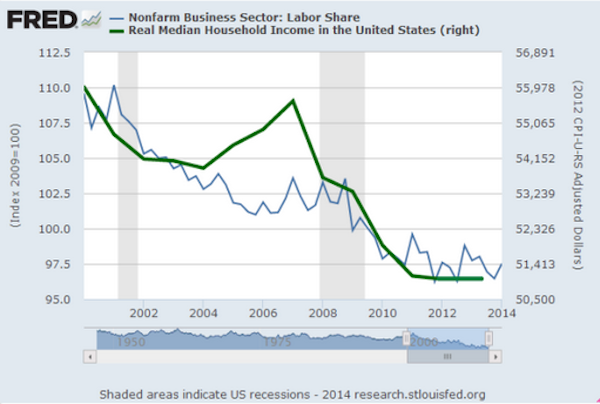 The below graph highlights that real median household income in the United States has slipped significantly since 2006, when it peaked at the height of the housing bubble. Nationally, asking prices (year-over-year in June 2014) rose faster than wages per worker (year-over-year in 2013) in 95 of the 100 largest metro areas. Translated – it is getting increasingly more difficult for people to afford to buy a home. This problem has been most pronounced in those areas most impacted by the housing bubble, namely California and the Southwest. In Phoenix, Las Vegas, Sacramento, and Orange County, price gains have slowed significantly in recent months after rising nearly 20% year over year in 2013 due to the latest investor speculation wave. While private equity firms are snapping up houses as unprecedented rates, the average worker is finding it harder and harder to rent or own a house. Indeed, companies like the Blackstone Group, American Homes4Rent, Colony Financial, Silver Bay, Starwood Waypoint, and American Residential have spent approximately $20 billion purchasing nearly 150,000 single family homes nationwide, and converted them into rental properties. Housing advocates say that the after effect of the housing bubble has been the institutionalization of the single-family rental market, leading Wall Street to take a more direct role at playing landlord, while transforming a rental industry that was once dominated by mom-and-pop owners into one where Wall Street is a major player, once again transforming the housing market in ways never seen. 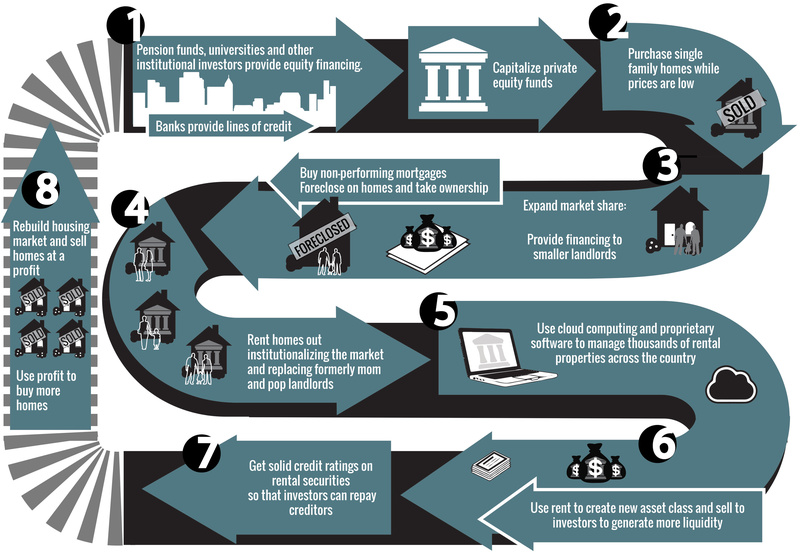 The below infographic shows how private equity has transformed the rental market since the housing bust.